Sheep vs. Goats — by Todd Macfarlane | RANGEfire! First published in Stockman Grass Farmer. SHEEP vs. GOATS — What are the Differences and Similarities? There are no two ways about it, although there are similarities, there are also big differences between sheep and goats. There are plenty of Biblical references and parables that allude to this. Consequently, divergent attitudes about sheep and goats seem to be shaped by everything from Bible stories and classic Greek Mythology, to urban legends and second and third hand experience. And goats generally seem to take the brunt of it. 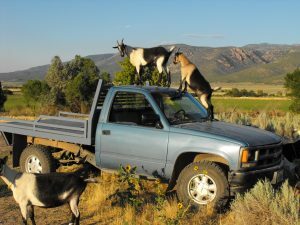 What I find interesting among many mainstream Americans, especially in rural, agricultural areas is the inherent negative bias against goats – often by people who have had absolutely no personal experience with them. The same way most cowboys dislike sheep, a lot of people, including most conventional farmers, hate goats. In terms of fundamental differences between sheep and goats from a production perspective, I should note right at the outset that I’m going to talk in generalities. There are exceptions to every rule. In addition to the differences between the species, there can also be very big differences between breeds within a species. Neither all sheep nor all goats behave exactly the same way. Much has been said about the fact that sheep are grazers and goats are browsers. It has been explained that, among other things, what this means is that Goats prefer to browse on leaves and bushes above their shoulders, with their heads up, and sheep prefer to graze grass and other forage closer to the ground, with their heads down. So obviously, the types of forage available make a huge difference. For example, in our area, goats love to browse on green leafy willows, bushes and trees along riparian areas, sometimes standing on their hind legs to reach leaves as high as they possibly can, whereas sheep show virtually no interest in that kind of forage. But there is some overlap in their forage preferences. In our case, both sheep and goats seem to love and do very well on morning glory. And sheep may be interested in some browse and leafy bushes that grow closer to the ground. But the other big difference is what else goats do while eating. Sheep typically put their heads down and get down to business grazing – when they are eating, that’s pretty much all they do. Once they start grazing, a half hour later there’s a good chance you’ll find the whole bunch still together in about the same spot systematically mowing the vegetation. Goats are a completely different story. They have a boundless sense of curiosity, and are easily distracted. They always want to know what is just over the horizon, and they’re always looking for a good reason to spook and run off. If you put goats in a pasture to graze, a half hour later they could be anywhere. In all likelihood, they will have made several laps around the pasture, grabbing a bite here and a bite there, about every second or third step. Goats are like perpetual motion machines. Consequently, they can be more challenging to herd and tend. Goats also have a much-exaggerated reputation for eating anything, including tin cans. The reality is that goats are highly selective browsers/grazers with distinct preferences, and often have little interest in eating exactly what you may want them to eat, unless forced to it – which is challenging to do because of their unique ability to “get out” and escape enclosures. Again, the basic rule of thumb is that if it’s not water tight, and won’t hold water, it won’t hold goats. And the biggest witnesses of this fact are typically neighbors who have had someone’s goats get out and eat all their flowers, or their garden, or their vines, or their fruit trees, or . . . the list is endless. But, if forced, goats will eventually eat almost any vegetation. As compared to sheep, goats inherently seem to have a much more mischievous nature (that varies somewhat from breed to breed), and therefore a much deserved reputation for essentially being a general pain in the neck. Consequently, most people who are not “goat people,” and especially those that have goats as neighbors, feel like their biases against goats are well justified. In addition to goats’ unique ability to escape enclosures and get where they are not supposed to be, one of people’s (i.e., neighbors, etc.) other biggest complaints is often the smell – which is almost always attributable only to the male billy goats, who really can stink, especially at certain times of the year, including breeding season. But I should also note that aside from stinky billies, smell is not usually much of an issue in pasture situations, but can be an issue even with females (does or nannies) confined in tight places including pens, folds, etc., for too long. There are several reasons why billy goats often stink so bad, including special glands on their heads, as well as a universally disgusting habit of drinking their own urine, and urinating all over their faces. You would probably have to see this happen to fully grasp how it is done. But both the practice itself, as well as the cumulative smell after the rancid urine accumulates in their hair for a few weeks, don’t do much for goat PR and public perception. On the other hand, aside from billy goat stench, despite all goats’ other interesting characteristics, most “goat people” absolutely love them because they are considered to have much more “personality” than sheep. The question is, should such subjective considerations as animal personality really drive business decisions. Moreover, having now had considerable experience with both sheep and goats myself, I will have to agree that goats do have more personality, but it is also this personality that often gets them into trouble. In addition to having strong curiosities, a high sense of adventure, and a nose for trouble, goats like to climb. Goats have a natural, inherent tendency to want to climb on anything and everything. Although they can be very nimble, and almost cat-like, this typically doesn’t go over well with the neighbors, or even Aunt Ethel, whose car they climb all over. Although both sheep and goats typically have a fairly strong flocking instinct (depending to some extent on breed), sheep tend to flock better. Goats, on the other hand, while more independent, are very cliquish, and as part of their whole social order, they can be very hard on each other. Consequently, whereas it may not be any big deal to mix different bunches of sheep, or introduce new sheep into a flock, it can be a challenge to mix bunches of goats, and it usually isn’t a good idea to introduce one or two new goats into an established bunch. The other goats, with an established clique and social order, can be very hard on newcomers. Goats are also very clannish. It is not uncommon to see several generations continue to socialize very closely and bed-down together, etc. Aside from night penning (which they seem naturally inclined to) goats don’t seem to do well in confinement. They have more tendency to get sick, and compared to sheep can be much harder on fences and equipment in . 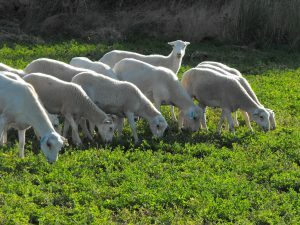 Although both sheep and goats are susceptible to parasites (with some variation according to breed), because of goats’ preference for browsing above the shoulder, rather than grazing closer to the ground, they seem to be more prone to parasites while in confinement, whereas sheep are more prone to parasites when grazing, especially in closely cropped pastures. Sheep and goats are probably equally susceptible to predators. One thing that may make goats more susceptible, however, is the fact that they are louder. Goats have a tendency to be real drama queens. One problem horned goats have that goes along with this is their unique ability to get their heads stuck in fences – especially in net wire field fencing that is often used for sheep and goats. A goat kid in distress can make enough racket to attract predators from miles around. In terms of predator protection, a number of things have been tried, from livestock guard dogs to lamas to burros, but dogs seem to be the most effective, and can do a pretty good job controlling predators. Watching good guard dogs do their job is almost as much fun as watching good herding dogs work. Guard dogs know their jobs, by instinct, and generally do it well. Climate is also a serious consideration. Goats seem to do better in a drier environment, and don’t really like to eat wet forage, which doesn’t really seem to bother sheep. That is something that we learned from our Navajo-style grazing operation. If was raining or the forage was wet, there was no point of wasting our time, because they would just run around and try to avoid settling down to browse/graze. This can also apply to heavy dew. Although we always seemed to want to get them out to graze “first thing” in the morning, often they would graze better an hour or two later, when the dew had gone off, whereas sheep are typically ready to get right down to business, regardless of the dew. Otherwise, sheep generally just act more business-like than goats. Most sheep, for example, could absolutely care less about personal attention, whereas goats often crave and respond to personal attention. Sheep also have far less tendency to get into trouble. For that reason, they are often considered to be dull, and without personality. Sheep are also often considered to be more helpless, and even looking for excuses and ways to die. Such tendencies are all part of widely-held philosophical paradigms regarding sheep and goats. The bottom line is, while there are many similarities, sheep and goats are very different. So, if you’re considering which one might be the best fit, consider the following questions (again, market factors should probably be one of your very first and most important considerations): What condition are your fences and other facilities in? What kind of forage do you have? How patient are you? Do you have a sense of adventure, and high tolerance for frustration? And don’t forget neighbors. Will they ever forgive you if your goats get out and eat their flowers, garden or fruit trees? Goats can provide a great opportunity. Aside from all important market and marketing considerations, however, if you have a conservative nature, or there is any significant amount of doubt regarding the answers to any of these questions, sheep may be the best bet. Once you’ve mastered sheep, and you’re ready for to take your production to the next level, goats could very well satisfy any need for adventure that your life may otherwise be lacking. But don’t forget that goats often require more proactive management, with better fences, and stronger equipment. 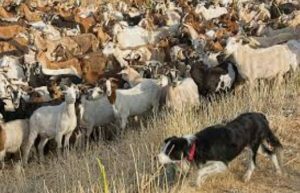 Whether one chooses to raise sheep or goats or both, for grazing operations my very best advice is to invest in a good border collie dog. In terms of saving both steps and frustration, a good dog can be worth its weight in gold.